A busbar (or bus bar) is a strip of metal used to conduct electricity within an electrical substation, distribution board, electric switchboard or other electrical equipment. 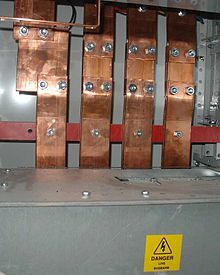 A busbar is usually a flat or hollow piece of copper, brass or aluminium. It allows heat to be released quickly because of its relatively large surface area. This page was last changed on 18 March 2018, at 05:43.